SAN BERNARDINO, Calif. --- Adventists in the Loma Linda are have been flocking to San Manuel Indian Bingo and Casino, a huge gaming complex close to the university. The traditional Adventist ban on gambling has been lifted for this specific casino in recognition of a major philanthropic contribution. A $10 million donation from casino profits made by the San Manuel Band of Serrano Indians will allow Loma Linda University Hospital to a open a new healthcare learning facility in downtown San Bernardino. On Wednesday, December 10, General Conference officials joined LLUH administrators and tribal representatives to break ground on the new San Manuel Gateway College construction project due to be completed in Spring 2016. 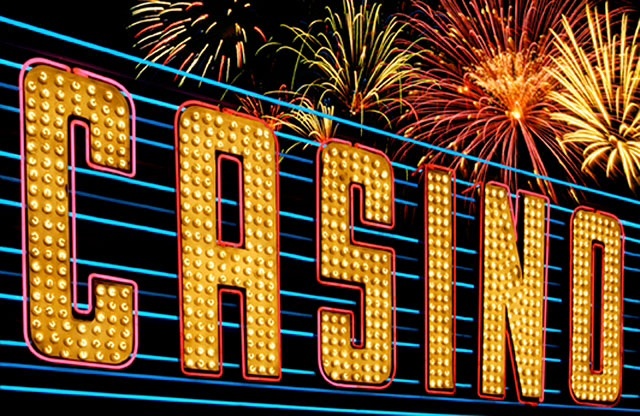 After the groundbreaking event GC officials unveiled an amendment to the denominational ban on gambling, stating that Adventist participation in "low risk slot machines and $5 or under black jack tables" is now allowed at pre-approved casinos. When asked for the list of pre-approved casinos, GC spokesperson Guillermo Torenz said that, for the time being, only San Manuel had been approved. "We are constantly reviewing our list, however, and are open to breaking ground on future learning facilities in Las Vegas and Atlantic City," said Torenz. I had to wrestle with this one for a bit. But I commend them for being willing to think beyond the box. This tribe felt we ministered to their felt needs when they were poor and needy and now that they have the money, it is a gift of sincere gratitude regardless of the source of income. It is quite a testimony of compassion and genuine christlikeness if we look beyond the externals. All bets are off! If there is a hint of Adventist involvement-it’s OK to indulge. Do not spend your tithe here. Let’s find out what other deals can be made all across the USA where Indian Casinos are concerned. Some new ones soon here in New York.Think of all the witnessing!! Baptisms galore. Bigger churches. Etc. A share of the profits-not prophets!! Woe is me!! History is replete with examples of the white man taking advantage of, abusing and mistreating the red man (and, in other countries, indigenous peoples of various color). It would be very easy for the red man to, now that he’s come into some bounty, thumb his nose at the white man. Instead, the red man has chosen to philanthropic/beneficent. I think the proper reaction of SDAs to the red man’s largesse should be gratitude. Besides, free will (so important in the Great Controversy, to my understanding), is at play here. No one is forced to gamble. And it’s only a sin if you lose, no? Gambling is pretty much a zero sum game (not unlike the stock market, except in this case the odds favor the house, as opposed to Wall Street insiders). Supposing Coors’, Anheuser/Busch, Miller’s, Swift’s, Tyson’s, American Tobacco, etc. gave big or bigger bucks to an SDA institution for medical research or higher education,what would be our reaction? Just wondering!! So to satire Adventists is to use humor, irony, exaggeration, or ridicule to expose and criticize people’s stupidity or vices in Adventism. But the authors of this website go a bit further by blatantly lying. In the December 14, 2014 article and other articles the authors create fictitious sources in the SDA church in order to cite an “authority” and mislead readers. Proverbs 6:16-19 There are six things that the Lord hates, seven that are an abomination to him: haughty eyes, a lying tongue… a false witness who breathes out lies, and one who sows discord among brothers. The authors of this site obviously have talents. It is wonderful to imagine how these talents might be used in sharing Jesus Christ to the unreached of this world. It is painful to imagine how many seekers among the Hindus, Buddhist, and Muslims of this world will be confused about God’s message for this time in history if they stumble across this site and read these articles. We are all accountable for our influence upon others. The authors have already demonstrated sufficient awareness of the negative effect such writings have on other minds. In his Spectrum interview the author says “Some of the tirades from incensed readers illustrate the point behind our stories better than the stories themselves.” This individual seems to be the case of someone locked inside an Adventist culture divorced from the Biblical reality of the love of God designed to save from the judgment to come. At such a time as this the author wants to satire God’s church and message? After investigation I have learned the identity of at least one of the authors of this site. He is a baptized SDA, graduate of Andrews, and who teaches Sabbath School in his church. According to his Spectrum interview “we are staying anonymous [so] that the mystique sort of helps the mood of the site, keeps it light… But we’ll probably come out at some point.” Well it would be well for you to come out in the next few days and make yourself known. This will provide an opportunity for you to delete your articles and apologize to your readers for lying to them. Dude, settle down, Satire is not lies made up to make up facts. It is fiction writing for the purpose of humorous metaphor. Your position as a judge is what is actually unbiblical as olpposed to the extra-biblical teaching from Ellen white that humor is sinful. Did you even read the article before commenting? Obviously not. Have you any idea what gambling does to individuals? Have you any idea how gambling ruins families and societies? The author of this article is quoting fictitious GC officials as saying that a habit so evil and destructive (secular people agree) is now okay. You say “settle down.” Go tell that to the wife of a husband that just lost everything at a casino. Tell that to her crying kids. What nerve! “Your position as a judge” Well thanks, I’m glad you noticed. I am a judge. When I see people murder I call the police and report murder. To be quiet and say nothing in the event of something so overt is a crime by itself. Maybe the author of this article is a really nice guy inside and has warm fuzzies for everyone but he is publishing lies and misleading people. if you read my comment you would see that he himself acknowledged how many people he is upsetting. “Ellen White”….who pointed to the Bible as the final authority. There is no need to quote from EGW, The Bible is all sufficient. Do you realize they are agreeing with you? I get that gambling is a trigger for you and i respect that. Can you respect my trigger that a lack of funny bone has historically been a special burden of those who idolize ellen white? “a way of using humor to show that someone or something is foolish, weak, bad, etc. : humor that shows the weaknesses or bad qualities of a person, government, society, etc. It is purposely fiction. To say religious datire is lying would be like saying john bunyan was a liar for writing pilgrims progress. It’s all metaphor. Nothing more. Fyi “settle down” is a bit of a belly polk as well. Again did you even read the article? There is no mention of Ellen White in the article, leave that woman alone. You defend satire….show just one obedient and faithful follower of Jesus who chose to sacrifice everything for the Truth because satire won them away from the world. ….show just one example in all history. Oh, PUH-LEEZE all bleeping ready!!! Get a life! Put together a paragraph without quoting EGW! Under normal circumstances I would find this story about LLU quite humorous but under the current circumstances it’s not so funny. The circumstances being the real acceptance by LLU’s estranged sister LSU of a large donation by the country’s most notorious abortionist, Edward C. Allred. I suppose the church should welcome this new opportunity to expand our witness, and naming one of LSU’s “business” programs the Edward C. Allred Center certainly is a public gesture of our mission to combine the killing of the unborn with our health message (ala “To Make Man Whole”), but knowing that Dr.Allred was also the CEO of Los Alamitos Race Track (horse racing) while choosing to ignore the positive cultural contributions to the community by the local Native Americans of San Manuel, one can only express disappointed that a major Adventist institution continues to perpetuate the myth of the white man’s superiority. I have a question for the people that don’t appreciate satire. What should the church do if a non-member friend of the church donated an operating Nevada casino to the church? In order to sell the casino and use the funds, the church would need to operate it 24-7 for several months while the Nevada gaming commission process was followed to effect a sale. Lighten up, RB! Your comments do nothing to make Adventism appealing. Quite the opposite. In your many Bible studies with others, please enlighten us all how satire helps win people to Bible truth. We are all waiting for you to share with us the golden rules of making Bible truth “appealing.” Doubtless you have much authority and lengthy, broad experience behind your statements. I want to win more people to God’s movement in these days, please teach me your rules for successful satire evangelism. “Quite the opposite” Is this your answer to the question: Does satire make people love Jesus love more? Actually, in real evangelism and sharing biblical truth, people deeply enjoy a balance of humor, depth, metaphor, and seriousness. What turns people off is when we are stoic, and overly intense. I even share my sinful struggles and weaknesses with people, and rather than having them turned off, it gives them hope and leads closer to depending on Jesus. Healthy fruit is a long term transformation, not a short term objective. Life must be lived in all of its dirt under the fingernails to be true, and we cannot oversimplify everything into intensity over death and hell. “all liars–their place will be in the fiery lake of burning sulfur”…just more satire right? Not John the revelator but the satirist? “They will be punished with everlasting destruction “….Paul on the satire bandwagon too! and of course Jesus “be afraid of the One who can destroy both soul and body in hell”…this is just a big joke, right? According to Shayne Mason Vincent it’s not about being simple and straight but as muddied, complex, abstract, and unreal as possible. Shayne, it’s too bad you couldn’t go back in time and tell all the OT prophets to not be so intense. Your comment is just a modified contemporary version of 2 Chron 18:7 Not telling people about heaven and hell is greatest evidence of indifference and hatred. Good luck raising your children or having a relationship with your spouse with that as the only theme in your life. I want you to know that I was like you say one time. And it didn’t work. It makes me sad when people can’t communicate. Perhaps it would be different if we had a real conversation. But as it stands, your just talking past me. I struggle to understand how to present things in a way that you might grasp what I am saying. Unfortunately, with folks that take the direction of thought that you are on, it never seems to get through. I have struggled for years to know why, to learn to speak to the heart, but the responses are almost always the same: assumptions of character, lambasting, manic intensity, and all in the name of defending God. Sigh. I often wonder if this is the fruit of those who read too much Ellen white, that depend on her for their entire worldview? But I find similar behaviors with other fundamentalist faiths. Please understand, I am not saying Jesus or SOP or biblical truth is wrong. But the way that we hold it can make a truth into an error. And there is a slanderous, self righteous, arrogant, demanding, even cruel obstinate spirit to many who are sincerely trying to defend the fath. And it is unproductive to the long term fruit of the spirit. Please reflect on what I am saying and consider it at least. And please, stop assuming that just because I believe something is humorous, or that I believe death and hell are not the only themes in the bible, also means that I don’t believe there will be a judgment for our actions… Only that our actions also include the spirit we hold with those whom we interact. for the third time, Did you even read the article? Until now you refuse to deal with the content of the article and make attempts to justify lies (AKA “humor and satire”) based on your supposed supernatural abilities to perceive the idolizing of Ellen White in the lives of others. Again for the record, Ellen White is not even mentioned in the article but you continue to use her as the reason for justifying lies.Sounds like you have a personal beef with Ellen White, sorry to hear that, I’m sure it can be dealt with in a reasonable way elsewhere. “Good luck raising your children or having a relationship with your spouse with that as the only theme in your life.”….this is comical because you follow it by accusing others of “assumptions of character.” Again you do not respond to the content of the article but base your response of your supernatural ability to know me, which is ludicrous. “Please reflect on what I am saying” and “your just talking past me”…translation “You better hear me but I will not hear you.” And in the same breath you want to counsel on having healthy relationships? one more: “Only that our actions also include the spirit we hold with those whom we interact.” hmmm, yes the spirit of questioning others’ personal lives because you have no solid biblical answer to publishing lies that blatantly encourage gambling? So u do not realize you have been doing that yourself the whole time which is why I am bringing it up? I have repeatedly answered your “lies” comment with “fiction” and “metaphor”. A slander and a lie is defined as: purposely telling a falsehood with the intention that a person believes your fabrication. Satire has nothing to do with deception, but with using intentional fiction to point out inconsistency in the actions of the person you are addressing. You are the one that has been abusive with your language toward commenters in this thread, and I am simply addressing your presentation. It reminds me of all those (my personal history included) who are avid Ellen white followers. If you are not a devotee of her harsh methods of chastising people for every possible thing under the sun, then I apologize. Anyway. I should know better after all these years than to engage with folks that have your perspective. I will never agree that fanaticism is from the Spirit of God and you can will never agree that anything I’m saying is true. So in the interest of charity, let’s stop the train of hard feelings and agree to disagree… Besides, if we were face to face, the conversation likely wouldn’t be filled with so much misunderstanding. Sarah, if you take a moment to simply look up the definitions of satire and humor you will see they are quite different….and you are cordially and kindly invited to share your “long-winded” support of gambling…please do enumerate carefully each point of support. While it may be a great temptation to respond to comments you do not like it would be more valuable to stay on point and address the morals and merits of promoting gambling among those who follow the humble man of Nazareth. Surely, if gambling is okay for the community and the church then you will have ample resources to support your position…I have sincerely searched the Bible in search of gambling examples that uplift people morally and spiritually but it has been a continual failure, would you so very kindly point out my hermeneutical errors? It does seem that people that comment here are in favor of satire but I’m just looking for support of gambling because that is what the article says. When my friends the Muslims, Buddhists, and Hindus (for whom Christ died) look for truth online I sincerely do not want them to be confused when they read that God’s church encourages gambling…I hope you understand and will make the sacrifice to respond intelligently in support of gambling. Thanks Sarah.